Amaka Offor, one of the alleged girlfriends of kidnap kingpin, Chukwudubem Onwuamadike, also known as Evans, has accused Evans’ lawyer, Olukoya Ogungbeje, of lying, insisting policemen never sexually molested her. Offor told Vanguard, yesterday, during an interview that she had never met Evans’ lawyer, saying she was shocked when she read the story of been sexually molested by the policemen who tried to use her in luring Evans out of hiding. She explained that she was yet to speak with Evans since he was arrested on June 9, by operatives of the Inspector General of Police Special Intelligence Response Team, IRT, and her attempt to visit him at the Kirikiri Maximum Prison has been unsuccessful. According to her, “I don’t know where that lawyer got his story from and I have never met him. “I have also not seen or spoken to Evans since he was arrested. I changed my phone number after he was arrested and I don’t think he has the new phone number. “After he was charged to court where he pleaded guilty, I tried to see him in prison and speak with him, but I was not allowed to see him. “The wardens did not tell me why I could not see him, but they took the food I brought for him and promised that they will give it to him. I was troubled when I read the story of the lawyer accusing the policemen, who arrested Evans, of sexually molesting me, while they were trying to use me to lure Evans out of hiding. “One week before Evans was arrested, some policemen accosted me on my way to the market and arrested me. Though they were hostile to me at the time they arrested me. “I was completely in shock when they told me that Evans who I know and still call Chukwuebuka Mike, was a robber and kidnapper. I did not believe it. They later told me that they wanted me to lure him to my house because I told them that he was found of my children and he normally spent time with us. The policemen were in my house, I was always in my room, and they were always in the seating room. They provided all the money we used in cooking throughout their one week stay in my house. They were strategizing on how to arrest Evans. They also bought the fuel we used in powering the generator. On the day Evans was arrested, he called me around 5:am and the policemen brought the phone to me in my room and gave it to me. I answered the call and he told me not to drop the call. I thought he was standing by the gate and I did not put on any slippers. I walked out of the gate on barefoot. When I opened the gate, I saw him parked across the road and I entered into his vehicle. The moment I saw him, I was panting and he asked what was happening. I told him policemen where in my house for one week and they were looking for him. He zoomed off immediately and took me to Iyana-Ipaja where he dropped me. He left with my phone. That was the last time I saw him. Meanwhile, a car dealer, Nnayelu Okonkwo, who Evans paid the $102,000, to purchase a Mercedes Benz G-Wagon in January 2016, from the United State of American, has been arrested by the police. Vanguard learned that the car dealer was apprehended after weeks of trailing, following the alleged confessions by Evans on how he spent his loots from kidnapping. 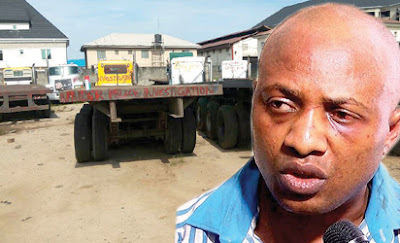 Evans was said to have informed the police when he was arrested that he sent part of the proceed he made from the kidnapping of James Uduji to the car dealer, Uduji an industrialist, paid $1.2million ransom before he was released. Police sources disclosed that that Evans called off the deal before the vehicle was delivered to him and Okonkwo refunded the sum of $67,000 to him adding that the balance of $34,000 was still in Okonkwo’s possession when Evans was arrested. Okonkwo told Vanguard when interviewed that he didn’t know that the money Evans paid to him was a proceed of kidnapping. He said he couldn’t return the complete balance to Evans after he called off the deal, because the money was not not in his possession, he also alleged that Evans lawyer, Ogunbeje, also collected $900,00 from the said money. According to him; “ I didn’t know that the money Evans sent to me in American was a proceed of kidnapping and when he was arrested I felt I was in trouble. I tried to inform the police about it and I don’t know who to call. But Evans lawyer started calling me and he mounted so much pressure on me and I was forced to pay the equivalent of $900,00 into his account.